The Shore Conference Tournament Basketball Committee in conjunction with Monmouth University has announced a limited pre-sale of tickets for Saturday’s championship doubleheader. Fans planning on attending the girls (5:30pm) and/or boys (7:30) games can purchase up to 10 tickets on Thursday, February 23 from 9am-12noon at the OceanFirst Bank Center Box Office. 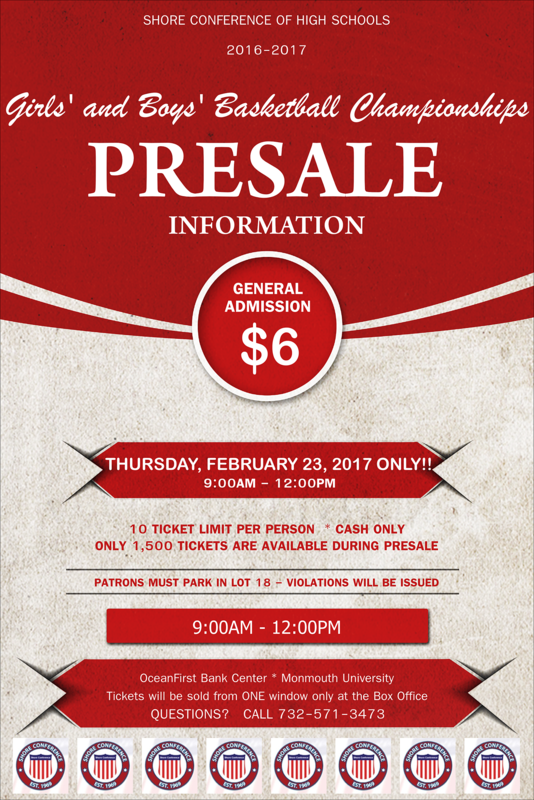 All tickets are $6.00 and only cash will be accepted for the pre-sale which will be limited to a total of 1,500 tickets. Anyone planning to purchase tickets on Thursday must park in Lot 18 which is near the baseball field and can be accessed from the Larchwood Avenue entrance to the campus. The box office will reopen on Saturday at 2pm for the purchase of tickets and the doors to the OceanFirst Bank Center will open at 4:30…one hour prior to the tipoff of the girl’s championship game between St. John Vianney and St. Rose. The boy’s final will follow at 7:30. Both games will be broadcast live by the Shore Sports Network on 1160 & 1310AM and streamed at shoresportsnetwork.com.